By the time it was January, there was enough and more been done on the Jeep already and it was time to put everything to test. 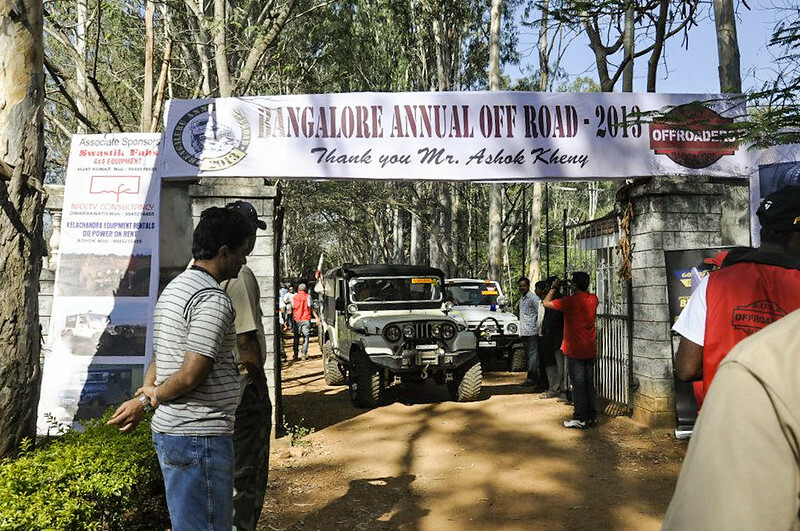 The Bangalore Annual OTR was the right event to start the off-road journey with the jeep. This was a two day even scheduled around the Republic Day to allow for folks to come from all around Bangalore and the neighboring states to enjoy the event. It was being conducted at the WRAC property in Banerghatta and the adjoning quarry area. I had watched some of the videos from the last year event, and this event was definitely not going to be a cake walk. 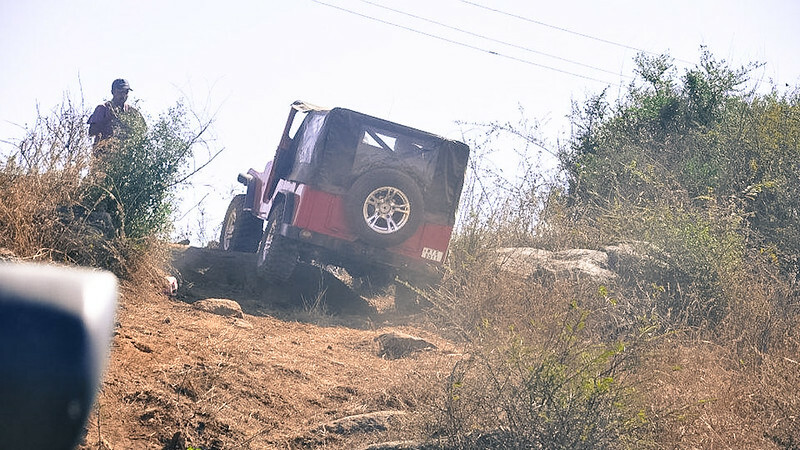 There was a lot of discussion around how the Bangalore events are very technical in nature and can be a jeeper's nightmare, if proper precautions are not taken. Being my first OTR, I wasn't sure if this was the most appropriate event to begin with, but then what’s the point in having a Jeep and not pushing it to the limits! Since about a week or two before the OTR, I was having an issue with the brakes. The brake pedal used to just lose all the pressure and sink it like it were dead. 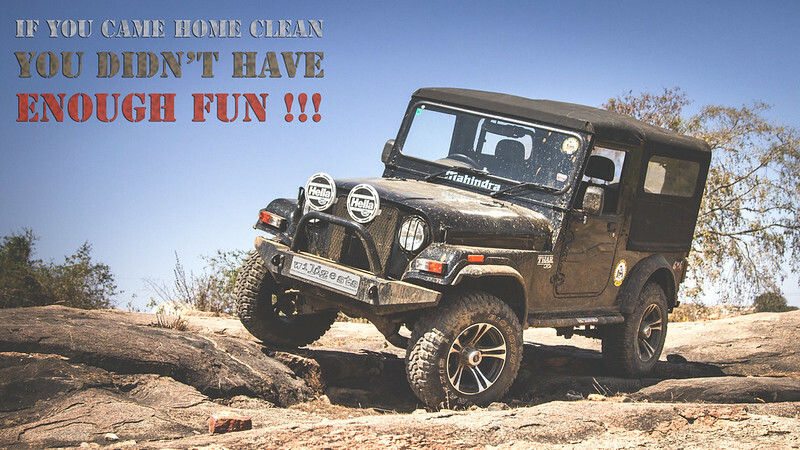 A quick visit to the Mahindra service center revealed that it was due to a leakage in the brake line. I was told that the problem was taken care of. Little did I know that it was not fixed entirely and it would haunt me again during the OTR (more on this later). Dealing with the Mahindra folks can really rise your blood pressure at times, may be that's what their tag line suggests...Mahindra Rise! But there's hardly anything you can do about it, at least in the first year you have to rely on them for servicing. The good thing about my visit to the ASC was that I met Tejas & Tejas who were planning to attend the OTR, so now I had atleast a couple of folks I knew at the event. 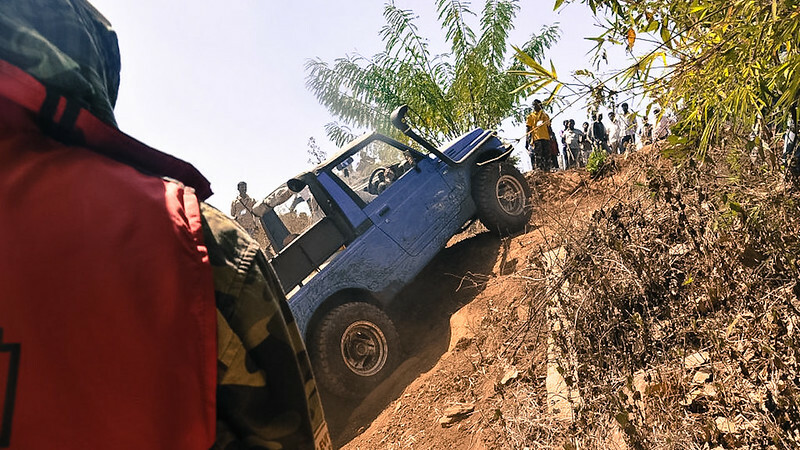 The event was scheduled to begin with the registrations on Thursday evening followed by two full days of off-roading to end the whole crazy affair on Saturday evening. At the event I again met Tejas who was at the service center on the previous day and he then introduced me his other friends. The settling in time on Thursday actually helped me in finding a nice group who gladly accepted me to join their convoy for the next two days. As a newbie, this was a very good thing since at a lot of places the encouragement by the fellow jeepers kept me going where I’d probably not have dared to those obstacles alone. Thank you fellas! There were a lot of groups that kept pouring in that night, and the celebrations went on till quite late in the night for most of them. But I was tucked away nicely in bed by 11 pm with the alarm set up for 5 in the morning. The organizers had done a splendid job of arranging accommodation and food for about 200 odd folks that night and going by that I was sure that the next 2 days were going to be equally enjoyable. The next day began early and most of the folks were up and busy with morning chores by about 6.30AM. The event was scheduled to begin at 8AM, but we’re in India and nobody starts on time here. I was expecting the flag off to happen at 10AM, and so it did. The late start was actually not a bad thing though. We had pretty much the whole day to go around in the jeep and we were probably going to drive around for 20-25kms overall, that’s it! 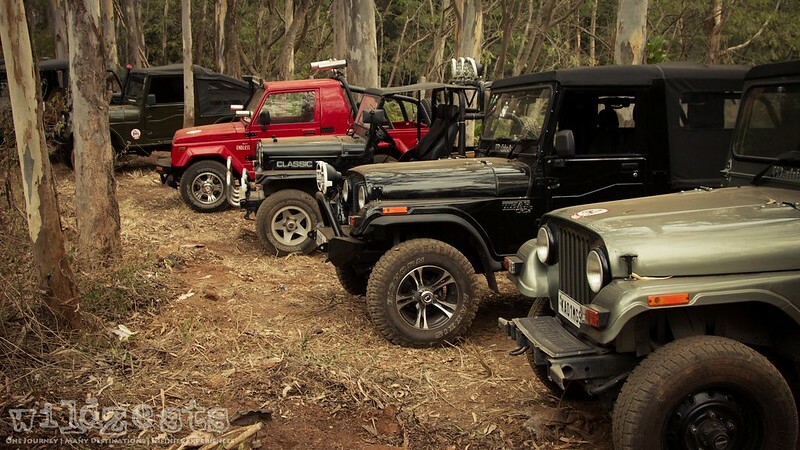 Given that there were 100 jeeps in total, there were 4 routes planned and each were supposed to host roughly 25 vehicles. Preferences were given to those who had come in groups so that people aren’t separated out from their groups. This was done even if that meant a little bit of give and take on the size limitation of 25 vehicles per route. It was actually very thoughtful of the organizers since it gave people an opportunity to hang out with their friends all through the trail. Every group had to complete two trails by the evening and we were assigned Trail 4 and Trail 1 to begin the day. 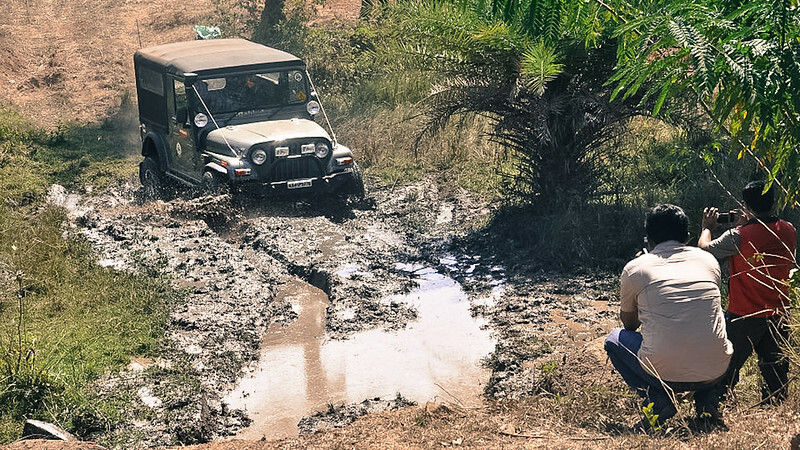 Trail 4 was mostly rocky and needed a lot of skill in ensuring that your tyres are climbing over specific rocks so that there is no underbody damage. Also, one had to take real good care of the speed while mounting and dismounting over large boulders so as to avoid damage to the vehicle. The first two obstacles were a little scary since this was the first time I was trying out something like this. But after that, it was more of fun than anything else. I was slowly getting a hang of it. If you followed the directions from the marshals, there was absolutely nothing to worry about. There was this one place where were negotiating our way through a lot of rocks and climbing up a hillock. There was barely enough place for the four tyres to be on the ground at the same time and at one point. 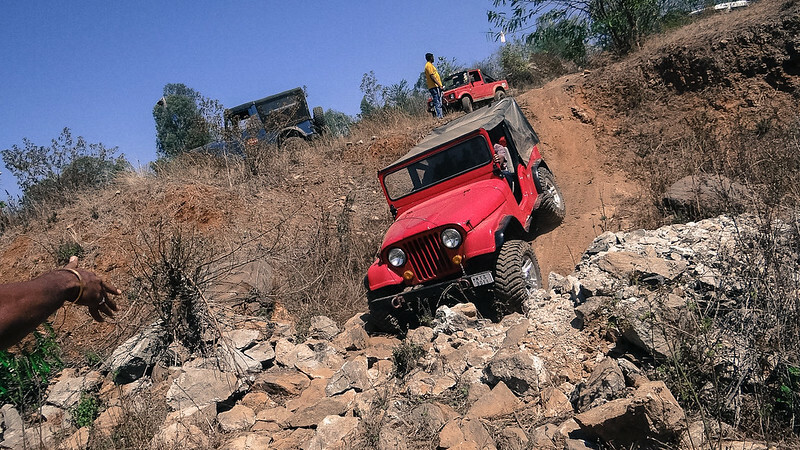 My jeep was stuck with the cross member resting on a huge rock, the tyres had no traction. After a couple of attempts, the 4WD failed to engage and there was no way I could come out of that situation on my own. I didn’t know what to do, neither did the marshal until a recovery vehicle arrived. I was hoping this shouldn’t be how it ends for me. If the 4x4 stopped working, there was no way I could go any further and the only thing to do was to retire and tow the jeep to the service center. 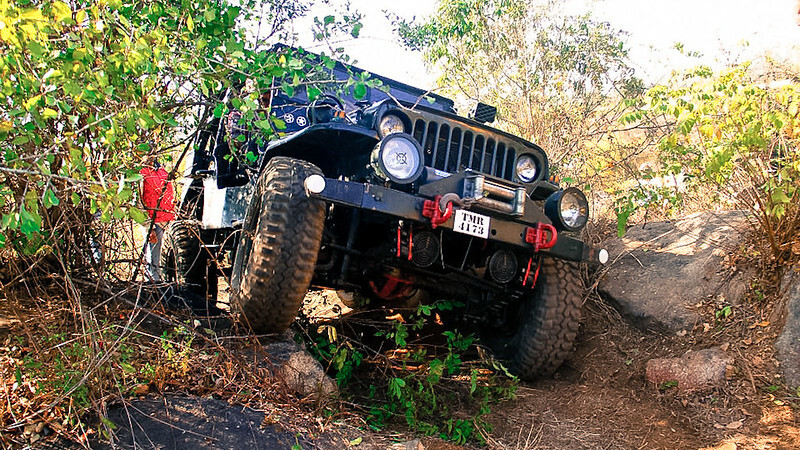 I wasn't convinced that the jeep would breakdown that easily, but you never know! 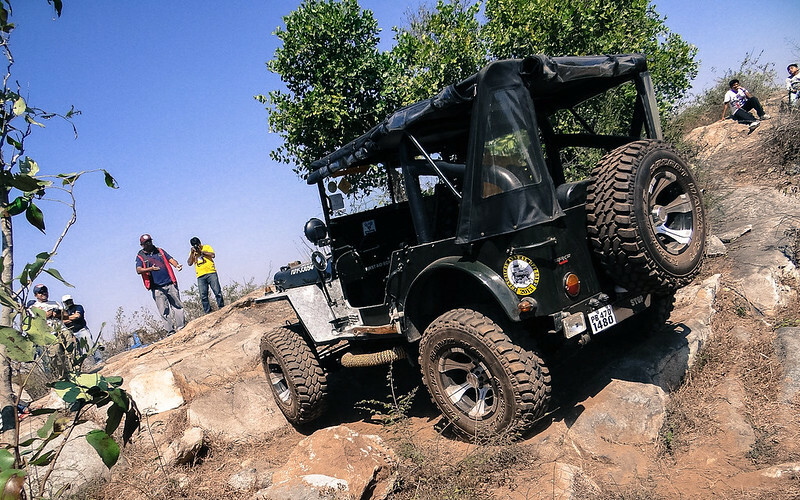 One of the marshals helped in pulling my jeep behind with his Force Gurkha using a tow strap. Once I was out of those rocks, I was a happy man again! The 4x4 engaged perfectly once the jeep was out. It looked like the 4x4 couldn't engage because the jeep was beached on the rock right where the transmission components are located. The rest of the trail was pretty uneventful and I could finish all through without issues. Post lunch we moved on to Trail 1 which was a fun trail with all the slush elements. 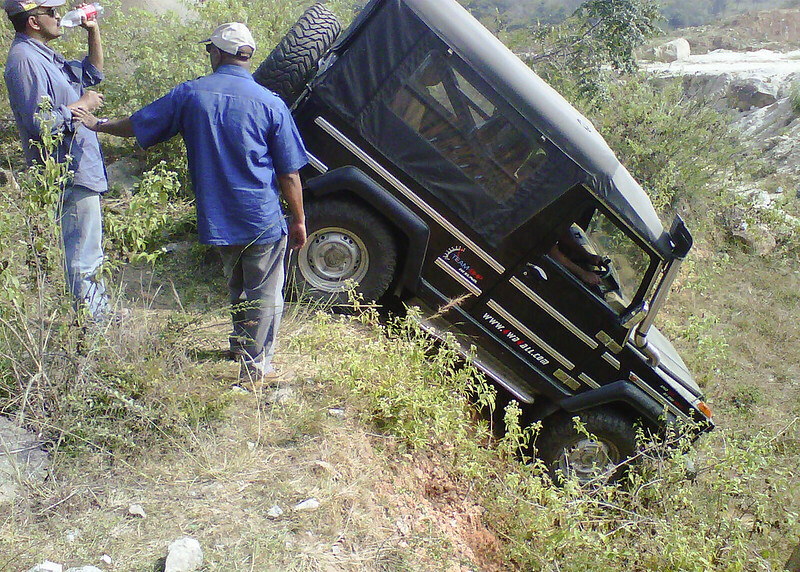 There was this first obstacle of climbing a 45deg incline where I took atleast 5-6 attempts. It wasn't a very difficult looking climb, all you needed was momentum to make it up there. There were huge rocks on the right as you exited the climb which had to be avoided at any cost. Too fast and you'd probably bang the jeep on those rocks, too slow and you'd be eating mud that the tyres would throw at you as they spun without any traction. Second Low was the call. 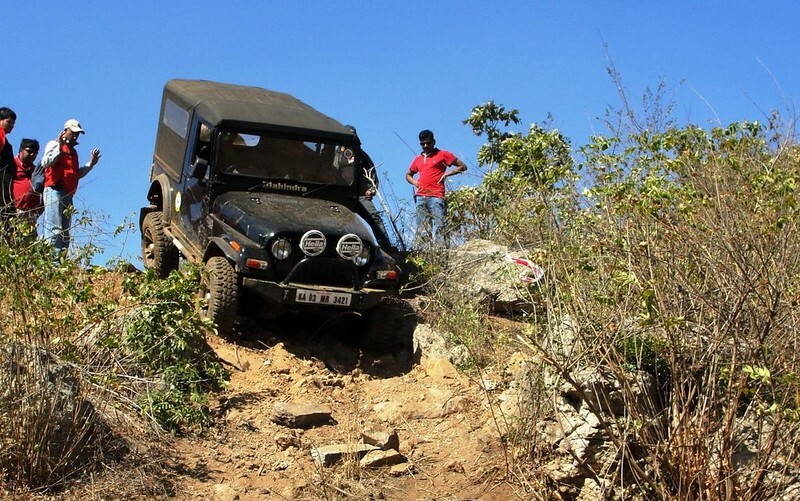 All I had to do was start the run-up in second gear and throttle it out fully till I tipped over the edge of the climb. What was happening in reality was, I was letting go of the accelerator once I was halfway through the climb thus getting stuck each time. By the end of the third attempt, there were locals who were betting on whether I’m going to make it or not. Finally, I did make it, but not without breaking the front fender. I guess I had a hard landing on the front wheels in the penultimate attempt which hit the fender on the tyres. This was the first of the battle scars on the jeep, I wasn't too worried, it had happened while doing exactly what I bought the jeep for. After the rather embarrassing first obstacle, it was time to go through some slush pits. I was enjoying it. There was this one place where I was given a choice. Attempt a slush that nobody had made it through, or take a relatively easier path and make it without assistance. I chose the former and finally got winched out at the end, the slush was just a little too much for anyone to handle. Getting winched was a good thing too, it was on my checklist of things to experience before I ordered winch for myself. After crossing this dreaded slush pit, there was a section that involved water fording and slush which was quite a bit of fun. 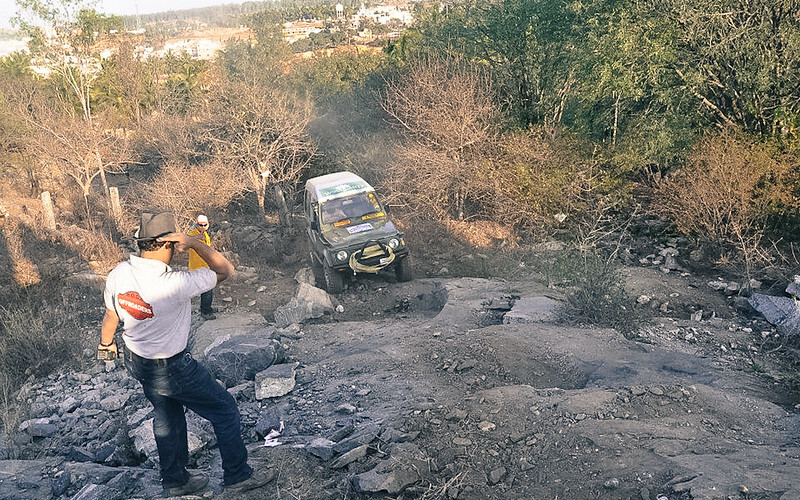 The first day had ended and all of us were really tired, even though it was the jeeps who had done most of the work. That evening, I came back home to be with Pozu. She was pretty upset when she found out that I had gone out to the jungle without taking her. It actually helped to be home that night since I could have a nice warm water bath followed by a very relaxed sleep. Next morning, I came to know that the camp site was buzzing until the wee hours of the morning with people singing and dancing together. It was pretty evident since today the progress in the morning was rather slow. It was Republic Day and the organizers had announced that we’d have some R-Day celebrations before we headed out to the trails. This also meant that we’d be starting a bit late, ie. 11AM. After the flag hoisting ceremony, everybody was herded to the parking lots and soon people were off into the wild again. Today we were scheduled to do Trail 3 and Trail 2. Trail 3 began pretty okay but there were some very technical sections. It was absolutely necessary to have faith in the marshals and keep following their directions to the tee. I made through this section pretty okay without any damage, but this was not the case with everyone in the group. There were reports of physical damage here and there, but nothing major to be worried about. We finished the trail a little ahead of time and were able to get about an hour and half for lunch atop a hill. If Trail 3 was technical, then Trail 2 could be called "highly" technical. There were some very challenging obstacles in this trail and at one of these obstacles, a jeep almost ran off the tracks. The accident wasn't really because of the trail though, that jeep had a brake problem and the owner still decided to take it down the steep incline. Luckily, there were no injuries or major damage to the vehicle. After about a 30 minute recovery effort, the jeep was slowly rolled down the path. This is when my confidence went down with my brakes. They had failed me once at an incline while climbing up and I got saved that time because there was enough time for me to respond. This wasn’t the place I could take a risk with them. It was a steep decline which a U-turn at a very tight spot, there was no margin for error. After a lot of deliberation, I finally backed out from doing this obstacle. I had to tell myself, this is my first OTR, I had already done a lot of things I never imagined before, so skipping on thing shouldn't be a big deal. At the end of the Trail 2, we were headed back to the resort for some quick snack before dispersing back to our homes. These two days were really enriching for me to understand the Thar’s abilities off the road and really enjoy it to the fullest. Overall, this was a really nice and crazy event where I officially graduated to be an off-roader! IMPORTANT NOTE: Most of the images used in this post (non-watermarked) are sourced from the BAOTR event page on Facebook. These have been shared on a public forum prior to me posting them here and thus I'm hoping that nobody would really be concerned about privacy issues. The copyright for all those images belongs to the respective owner and I am using them here only for illustrative purposes only. 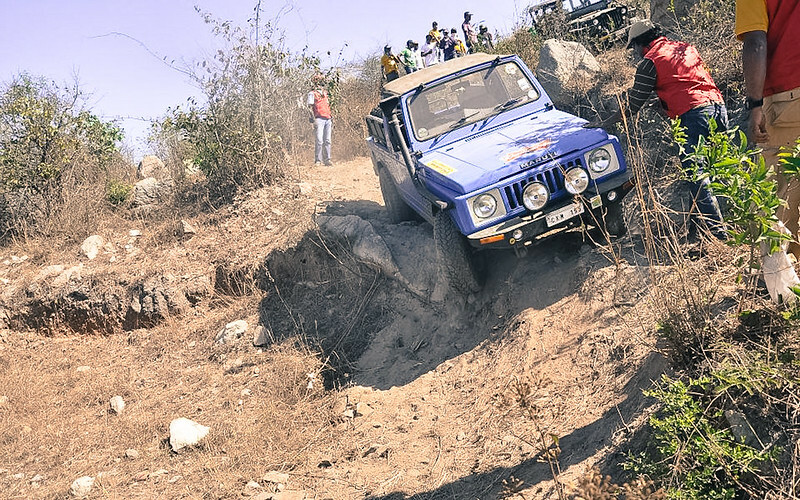 Being involved in driving throughout the event, I couldn't really capture the action myself and hence am borrowing pics to give an idea of what the terrain was like. Hope the original owners wouldn't mind my "innocent" infringement of their copyrights! Please reach me at admin@wildzests.com in case there are any objections to the images being used and action will be taken promptly. 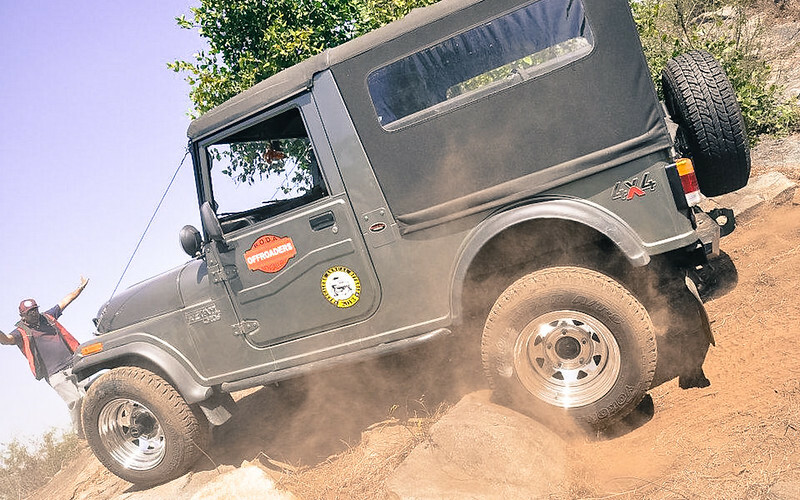 It is a very nice information about Mahindra Armada car.If anybody needs to Buy Mahindra Armada Tyres Online please visit Tyreonwheels.